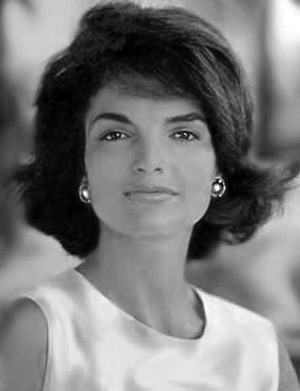 Jacqueline Lee (Bouvier) Kennedy Onassis (July 28, 1929 - May 19, 1994) was the wife of the 35th President of the United States, John F. Kennedy, and First Lady of the United States during his presidency from 1961 until his assassination in 1963. Five years later she married Greek shipping magnate Aristotle Onassis; they remained married until his death in 1975. A camel makes an elephant feel like a jet plane. An aim in life is the only fortune worth finding. Being a reporter seems a ticket out to the world. Even though people may be well known, they hold in their hearts the emotions of a simple person for the moments that are the most important of those we know on earth: birth, marriage and death. For a while I thought history was something that bitter old men wrote. I don't think there are any men who are faithful to their wives. If you bungle raising your children, I don't think whatever else you do well matters very much. If you cut people off from what nourishes them spiritually, something in them dies. If you produce one book you will have done something wonderful in your life. Once you can express yourself, you can tell the world what you want from it... All the changes in the world, for good or evil, were first brought about by words. One man can make a difference and every man should try. One must not let oneself be overwhelmed by sadness. Our culture will become like it was during the medieval times when there truly was a cultural elite. The rest of the people will just watch television, which will be their only frame of reference. There are many little ways to enlarge your child's world. Love of books is the best of all. There are two kinds of women, those who want power in the world and those who want power in bed. What is sad for women of my generation is that they weren't supposed to work if they had families. What were they to do when the children were grown- watch raindrops coming down the windowpane? You have to have been a Republican to know how good it is to be a Democrat.